Hello Lovelies !!! Now Spring is about to say good bye and the sun is smiling . The worst hair problem we face during summer is humidity ,as a result of which the volume factor of our hair suffers. 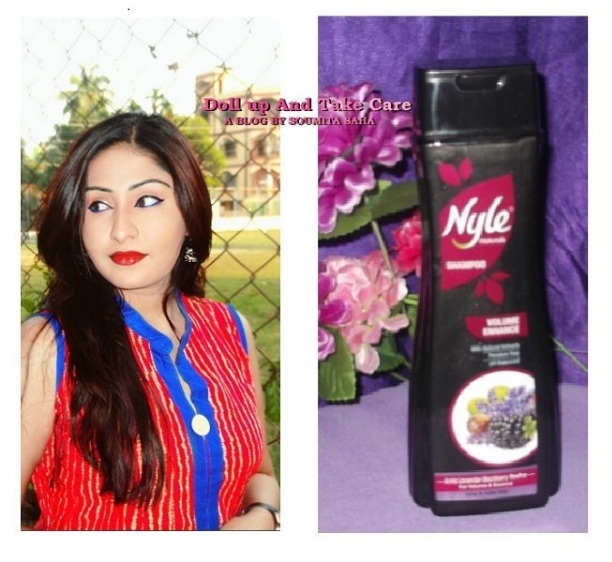 I received a few shampoos from Nyle’s new launches and after a satisfactory result Nyle Anti Dandruff Shampoo successfully managed to exhibit , I was pretty much excited to try the volume enhance variant . The best part about these shampoos from the house of Cavin Kare is ,they are paraben free . They do contain chemicals ,but none of them are fiercely harfull for scalp . In our country humidity is a factor , if your from kolkata you must knowing how humidity literally damages skin and hair . There are many shampoos from hi-end brands that are volume enhancing but their chemical compostion will restrict you from buying ,if you like natural care . This variant is pretty same as the old long and bouncy variant of Nyle . I did try sachettes from that variant , cleansing and softening was incredible but I was not satisfied with bounce factor it failed to keep promise . I was wondering if the new one is gonna be the old wine in new bottle ,but no I was surprised .. It worked like magic and actually did what it claims . Makes Dry and Rough hair soft and beautiful. With the Goodness of Amla, Green Tea and TulsiHealthy scalp & hair, Soft & Silky Hair, Protects hair from dryness. Nothing Heals like nature. This shampoo is black in colour and has consistency like lotion. It smells mostly of lavender and Amla .It smells mild , the fragrance lingers on in the hair for quite some time post a hair wash. I usually oil my hair at night and cleanse the next morning .I intentionally skipped the oiling step to check if it drips off natural oil from my scalp . I was surprised to see it neigther made my hair over dry ,nor was my scalp oily . The naural oil balance reigned undisturbed , while my scalp felt thoroughly cleansed. Every strand felt softer and managable . After three washes my hair looked shiny too . Now ,coming to the main factor it did not disappoint me like the previouse long and bouncy version . My hair did looked voluminious ,but if your are expecting drasting change that hair sprays gives then you may end up with a bit of disappointment . Pretty much available both on and offline. Cleanses hair very well, removes oil and dirt from hair effectively. Keep hair shiny and manageable. Post hair-wash I feel my hair soft and less tangled. Lovely smell ,yet ot overpowering . Didn’t make my hair dry or rough. Honestly, I could not find any .